Andy: This rum is REALLY good…So good I almost prefer it by itself over ice. It has a nice strong authentic mango aroma. It is like you are drinking straight mango juice. After trying it mixed with pineapple juice, this rum really stands up to the strong flavor of the pineapple. This is by far the best flavored rum I have had. I can’t wait to try their coffee flavored rum. It is definitely a little pricier than Malibu Mango or Mount Gay Mango, but it is well worth every penny. Delicious. 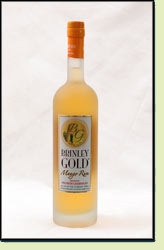 Adrian: Brinley Mango has a strong, sweet flavor. At 72 proof, it has higher alcohol content than most infused rums, but you can totally drink this rum straight. It tastes like a mango tree sucking on rum. As with all infused or flavored rums, we then taste it with pineapple juice. It tastes so smooth that a 5 year old could drink it without realizing there is any alcohol (note: feeding rum to children is not recommended) :-) . This is one of the best flavored rums…oops… I finished it. This is by far THE best flavored rum product I’ve ever tasted. The mango flavor is so bright and fresh, my mouth is watering just thinking about it. I probably differ from most people, in that I don’t like mixing my flavored rums or vodkas with juices or flavored sodas. Because I don’t like to taste the alcohol, I will mix straight spirits with flavored mixers to mask the alcohol. But with flavored spirits, I like to mix them with diet ginger ale. (Diet Canada Dry seems to work the best) It takes away the burn of the alcohol, and unlike Sprite or 7-Up, it doesn’t seem to alter the fruit flavor of the original product. (plus it doesn’t add any additional carbs or calories to the final drink) Anyway, I would highly recommend trying this stuff in your favorite rum drink.